Young Latino Catholics were a focal point at the V Encuentro gathering, which took place Sept. 20 to 23 in Grapevine, Tex., and hosted a special dinner for bishops and young adults. A majority of Catholics under 30 are Hispanic,according to the Public Religion Research Institute. Encuentro, which means “Encounter,” is a four-year initiative from the U.S. bishops, intended to better serve the growing Latin American community. The process began in 2016 and has involved consultation at the parish, diocesan, regional and now national level. It will continue through 2020. The gathering itself was mostly bilingual, with speakers and panelists often switching between English and Spanish to make different points. The Encuentro process has identified bilingual outreach—in terms of Masses, social media and other educational tools—as a key for the future church in the United States. Spanish is less often spoken among second- and third-generation immigrants,according to the Pew Research Center. Georgina Romero coordinates religious education and Hispanic outreach at Holy Family Church in Missouri City, Tex. For catechism classes, she has the whole family attend together. Evenings include religious education and dinners that also serve as fundraisers. A bilingual textbook helps bridge language preferences between parents and children, Ms. Romero said. The food and the community dimension of the evenings help Latinos feel like they belong in the parish, she said. Young Latinos are engaged. They are open to giving of themselves. Archbishop José Gomez of Los Angeles, vice president of the U.S. Conference of Catholic Bishops, said more had to be done for young Catholics and to encourage vocations. Young Catholic Latinos want ministry to be in their culture, which may come in either English or Spanish, according to Oscar Godinez, who coordinates Young Adults for Christ in the Diocese of San Jose, Calif.
Young adults may operate from within two cultures and may know two languages. Having them involved, Mr. Godinez said, can bridge age gaps in Hispanic ministry. But a number of young adults at V Encuentro expressed frustrations that their pastors did not trust them with ministerial responsibilities. Dreamers were not forgotten at V Encuentro. Young adults from the Diocese of San Bernardino, Calif., put on a brief play about undocumented immigrants who came to the United States as children. In the play, two young women play Dreamers advocating for immigrants. The characters express having not felt welcomed by the church or in youth ministry programs, but they decide to give the church another chance. The play modeled an encounter that was familiar to the more than 3,200 that gathered at the Gaylord Convention Center. 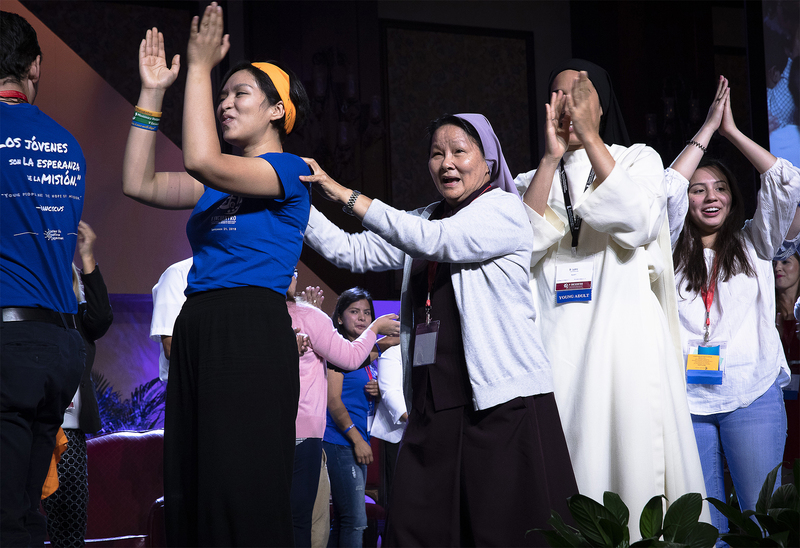 These delegates, who hailed from dioceses across the United States, represented countless others who are taking part in the V Encuentro process. They have answered Pope Francis’ call to go to the peripheries and listen to those who are on the margins of society. While it was not a key point of the conference, Mr. Godinez mentioned outreach to Latinos who are part of the L.G.B.T. community, since those who have been marginalized include L.G.B.T. Latinos. Archbishop García-Siller told America the church is still learning how to accompany the Latino L.G.B.T. community. But the church needs to accompany everyone, he said. Latinos still fail to recognize the leadership role of women in our church. Hosffman Ospino, associate professor of Hispanic ministry and religious education at Boston College, also noted a gender gap. “Latinos still fail to recognize the leadership role of women in our church,” he said. The national gathering itself is an example, as there were a far greater number of men who served as keynote speakers and panelists. Cecilia Gonzalez-Andrieu, associate professor of theology at Loyola Marymount University in Los Angeles, said the gender disparity did not go unnoticed by delegates. Mr. Ospino also noted the low number of people involved in Hispanic ministry in dioceses across the country. “Sometimes we have one person to serve half the diocese and 60 to serve the other half,” he said, adding that hiring young adult Latinos could help with that. Cardinal Joseph Tobin of Newark, N.J., said the conversations during the national gathering could help attendees discern where God is calling the church. The first Encuentro was in 1972 and the most recent was in 2000, before the advent of social media. At V Encuentro, delegates identified the way the church communicates using new media as another challenge. Perhaps in an effort to counteract anti-immigrant demonstrations, security guards checked participants’ badges to the large gatherings. The national gathering was not a public event. Aspreviously reported, some undocumented immigrants did not travel to Encuentro events because they feared immigration enforcement. The bishops did not ignore this summer’s revelations about sexual abuse. Both Archbishop García-Siller and Cardinal Daniel DiNardo, the archbishop of Galveston-Houston and president of the U.S. Conference of Catholic Bishops, addressed it on the opening night. Archbishop Gomez said the church needs to focus on healing for sexual abuse survivors. He noted the steps the U.S. bishopsput in place earlier this month, which call for a greater oversight role by the laity and for a third-party reporting system. Before the national gathering began, Carlos Salguero, a lay volunteer at St. Bede in Hayward, Calif., stood in the hourlong hotel check-in line. When more than 3,000 are checking in, it takes a while. But he and most of the other delegates were joyful. How am I going to love something I do not know? We have to help others come to know what we know. Mr. Salguero does not know what to make of the recent sexual abuse crisis and he is unsure how it will impact the V Encuentro process, which did not end at the national gathering. Instead, he said delegates are focused on being missionary disciples. As he spoke, Bishop Gerald Barnes of San Bernardino walked by. “Oh hi, bishop!” Mr. Salgado patted the bishop on the shoulder. He had met Bishop Barnes during his regional Encuentro in California. This article also appeared in print, under the headline "At fifth national Encuentro, young Latino Catholics are ready to lead," in the October 15, 2018 issue.